"Greg Rucka! He is the coolest graphic writer. I love him... Lazarus is sick." 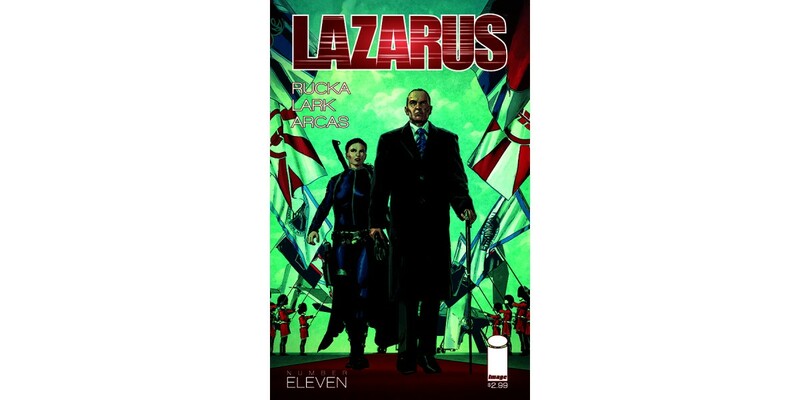 Eisner Award-winning writer Greg Rucka and Eisner Award-winning artist Michael Lark return with the eagerly anticipated new story arc of the New York Times bestselling dystopian thriller, LAZARUS. A dark marriage of Divergent and The Godfather, LAZARUS #11 will blow away fans of the series with its next installment of Forever Carlyle’s journey: “Conclave.” This is the perfect entry point for those who haven’t yet started the series that critics can’t stop raving about. Rucka hinted that the new story arc to the series will kick things up a notch, whereas the first year laid the groundwork for readers and focused on world building and character development. “This is the first time we get to see the majority of the power players in our world all in the same place—the ruling Families and, in many cases, their Lazari,” said Rucka. LAZARUS #11 arrives in stores this September and will be available for $3.50. It can be pre-ordered using Diamond Code JUL140444.